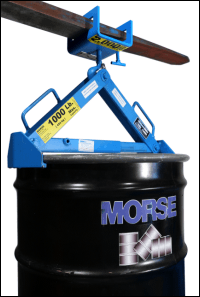 Morse Drum Tumblers Save You Time, Labor and Money! ...One drum mixer to blend them all! 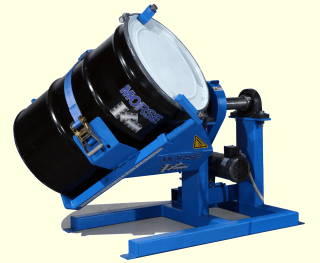 The Drum Tumbler is shown here with Morse Control Package (sold separately). OSHA Requires enclosure with interlock. Shown without enclosure for clarity only. 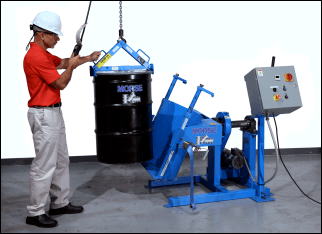 Easy to load a drum with your hoist to avoid the hazards of manual drum handling. 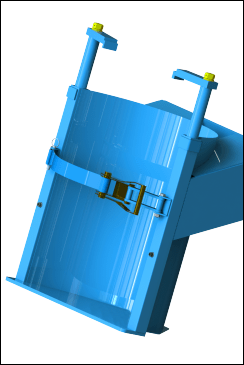 Quickly load an upright drum into the Drum Tumbler with Morse model 92 Below-Hook Drum Lifter and your hoist or crane (shown left). . .
. . .or with your forklift, model 284 Fork Hook and a model 92 below-hook drum lifter (shown right). The Drum Holder on Drum Tumblers secures a drum in the drum holder. It supports the drum from below on a base plate under the drum, has two screw down clamps on top of the drum, and a polyester web strap and ratchet around drum. 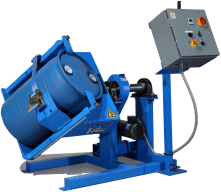 Tumble drum 29" to 37"
Tumble drum 18" to 23.5"
Half-full Capacity is an indication of the capacity for tilting an unbalanced, bottom-heavy drum. A partially full drum with an unbalanced and shifting load is harder to tilt than a full drum. Morse drum Tumbler Control Mast and NEMA 4/12 Control Box with Timer, Start and Stop Buttons, Red Emergency Stop Button, Lockable Main Disconnect, and wire terminals for safety interlock switch. Control Mast and NEMA 7/9 Explosion-Proof Control Box with Start and Stop Buttons, Run / Jog Selector Switch and wire terminals for external connection of safety interlock switch. 309-1 TEFC 1 1-Phase 115 60 12.8 14 638 Lb. (290 kg) L72" W42" H46"
309-E1 Explosion proof ** 1 1-Phase 115 60 13 14 638 Lb. 309-E3 Explosion proof ** 1 3-Phase 208 60 3.1 14 638 Lb. 309-E3-575 Explosion proof ** 1 3-Phase 575 60 1.2 14 638 Lb. flow and pressure) 638 Lb. 309-E1-50 Explosion proof ** 1 1-Phase 110 50 6.2 12 638 Lb. 309-E3-50 Explosion proof ** 1 3-Phase 230 50 3.5 12 638 Lb. 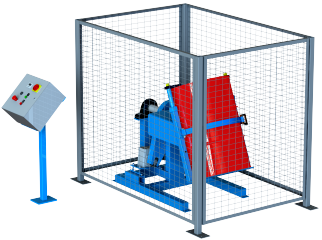 5979X-P Fully enclosed crate for export of Drum Tumbler and Control Package 200 Lb. (91 kg) L57" x W35" H56"
5980X-P Fully enclosed crate for export of Drum Tumbler with Controls and Enclosure Kit 480 Lb. (218 kg) L78" x W47" x H69"
* ONLY NON-Explosion Proof AC Control Packages include a pre-wired control box. Models ordered with explosion proof Control Package have no wiring from the NEMA 7/9 control box to the motor. Please consult an electrician to complete the wiring in accordance to your local code. ** Explosion Proof motors on models 309-E1 and 309-E1-50 are rated for Class 1 Group D.
Other Explosion Proof motors are rated for Class I Group D, and Class II Groups F and G.
Air powered model requires plant air at 40 to 60 psi and flowing at a rate of 40 scfm. 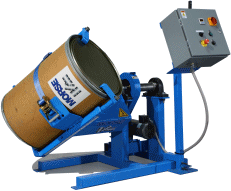 Air Powered Drum Tumbler (model 309-A) rotates a drum at 14 RPM and allows you to vary RPM with air flow and pressure. Sound level during operation is about 75 db. 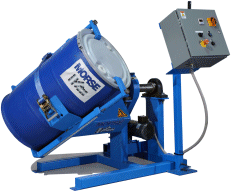 Morse Drum Tumblers - Morse Drum Tumblers provide "corner-over-corner" drum mixing to thoroughly blend contents right inside a sealed plastic, steel or fiber drum. 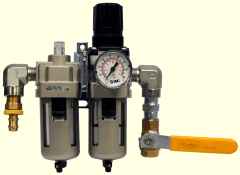 55-Gallon barrel agitators.